Customer satisfaction is a top priority for any business. When you meet your customers’ expectations, you end up with happy customers who stick with you. So what does a customer expect when it comes to shipping and delivery? Secure packages, swift delivery, and updates on the status of each shipment. While there are many shipping companies that fit the bill, there’s one trusted partner that’s known for delivering satisfaction despite snow, rain, and gloom of night: the United States Postal Service (USPS). In a 2017 study, 81% of respondents reported accurate delivery from USPS and 90% reported positive mail and package condition. That satisfaction is what you stand to gain if you enhance your order fulfillment process by integrating your Zoho Inventory with USPS. Why should you integrate with USPS? You can always ship your goods manually, but integrating with Zoho Inventory and shipping online via USPS comes with its benefits. For starters, you can save up to 65% of your shipping cost when compared to going to the post office in person. You’ll also save valuable time by preparing your packages and postage in your own office. 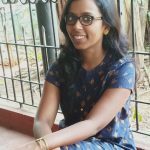 Besides, USPS Priority Mail is one of the most sought after shipping service for many e-commerce businesses that sell through Amazon, Etsy, eBay and Shopify. Ship your goods right from your marketplaces with the global network of USPS that delivers to more than 157 million addresses across the US. What will you get from integrating? A shipping integration isn’t complete without accurate rate information. You no longer have to interrupt your shipping process to check for rates from USPS. 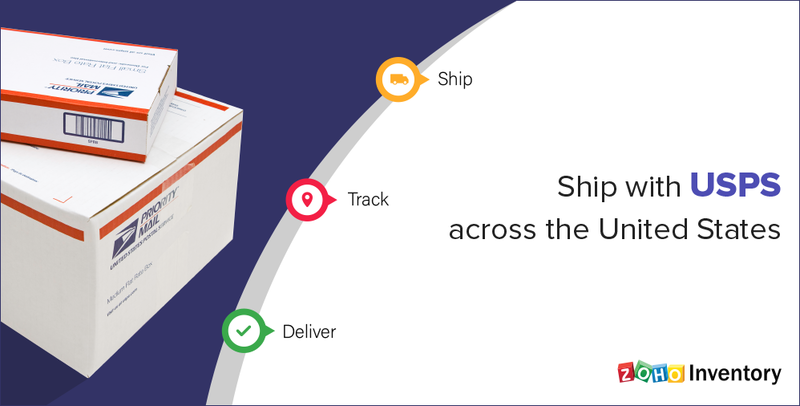 Zoho Inventory pulls real-time shipping rates from USPS to help you find the best shipping option for each package. 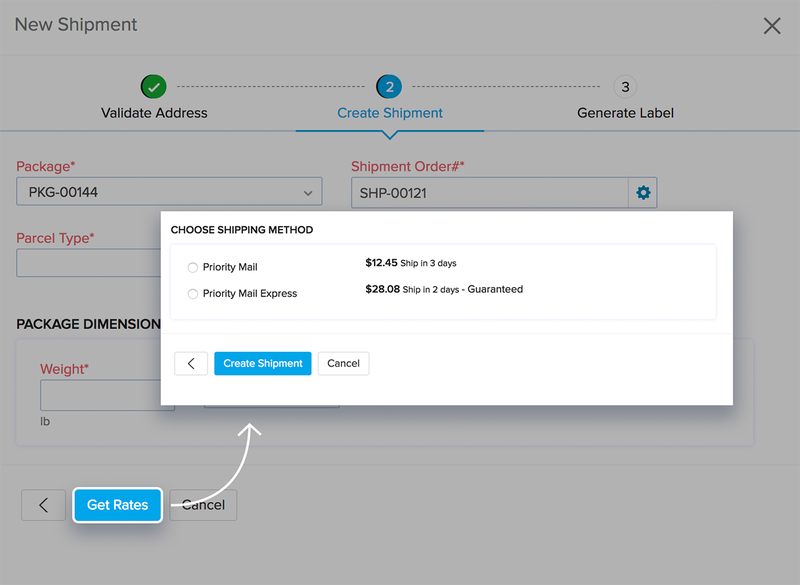 Once you’ve entered the parcel type and packaging details, you can view rates and shipping methods right from the create shipment page. If packages get lost en route or delivered to the wrong address, it’s bound to put a strain on your customer relationships. Steer clear of these delivery mishaps by generating your own shipping labels. 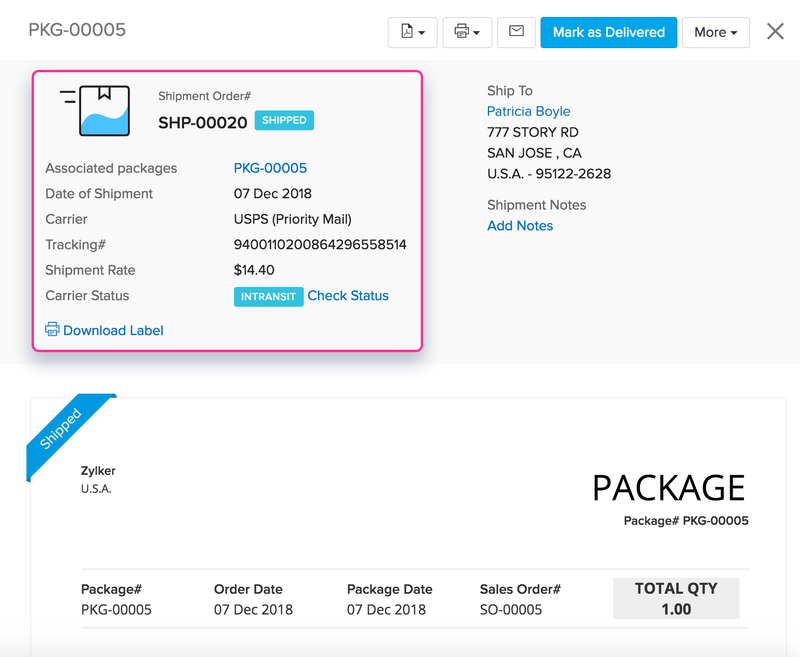 By integrating Zoho Inventory with USPS, you can automatically populate shipping labels with details from your Zoho Inventory packing slips. 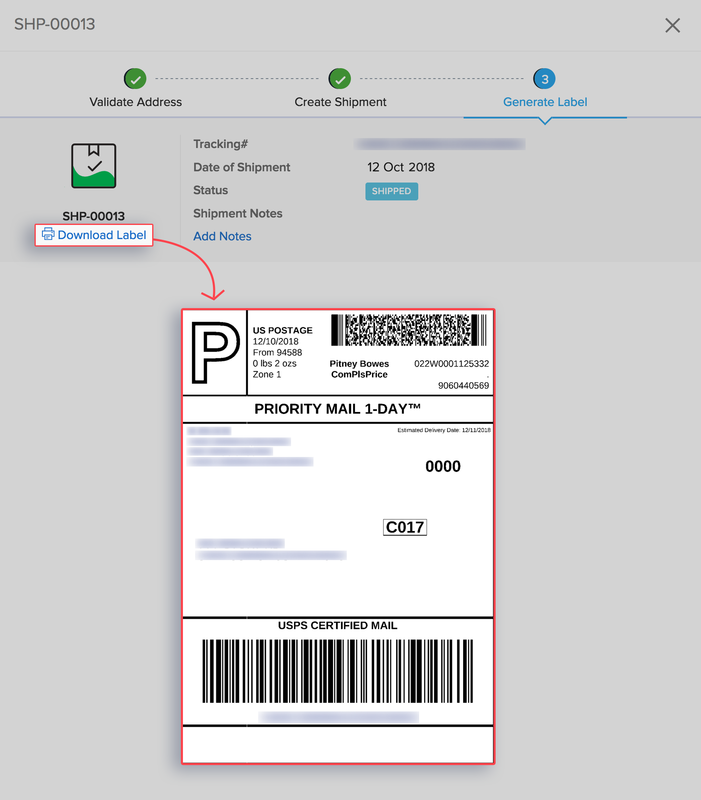 USPS will pull the customer’s information and add your selected shipping and tracking information to create a complete shipping label — all you have to do is download it, print it, and attach it to the package. Shipment tracking is an integral part of order fulfilment. With Zoho Inventory, you’re always up-to-date on the status of your shipments. Zoho Inventory automatically retrieves the USPS tracking number for each shipment and updates the package’s status every 24 hours. You can check for real-time status information at any time from your Shipped Package page in Zoho Inventory. Now address customer queries on orders with ease. Zoho Inventory’s tight integration with Zoho CRM and Zoho Desk ensures that your sales and support teams are always in the loop with the shipment details. As your business grows, so does the number of shipments you send out. Keeping track of them all can become a Herculean task. Keep tabs on all of your USPS shipments by simply logging in to the merchant portal. 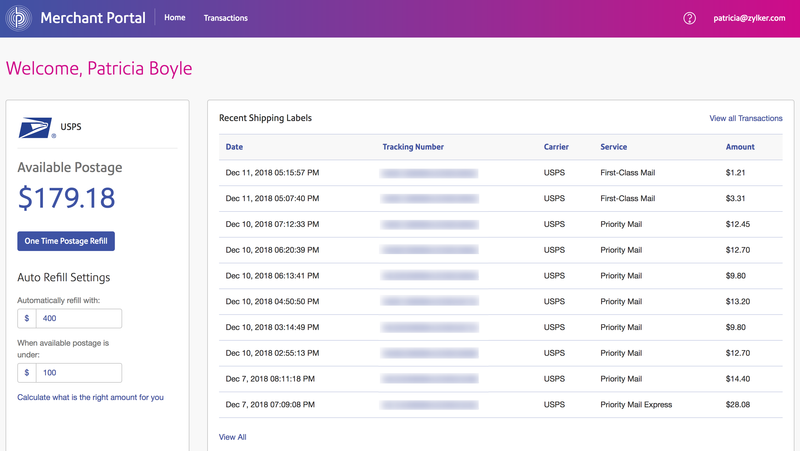 You can see the shipping date, tracking number, and shipping rate for all of your shipments in one glance. This integration is powered by Pitney Bowes, one of USPS’s certified service providers. To get started, you’ll need to create an account in Pitney Bowes through Zoho Inventory. Do this before March 31, 2019 and get a free subscription to Pitney Bowes for a year! To know more about the integration, head over to our help document. Integrate Zoho Inventory with USPS to enjoy a smooth and hassle-free shipping experience. Try out the integration and let us know what you think in the comments below. Feel free to contact our support team who are just an email or phone call away.